It doesn't take much talent to point a camera at a pile of sticks, which is probably why I'm so good at it. Then again, I've had a lot of practice. For two decades strong, all manners of calamity have passed through my glass. Minivans flipped by wind, homes broken open up by fallen forests, flimsy splinters driven into sod -- I sometimes think I've shot it all. I haven't. 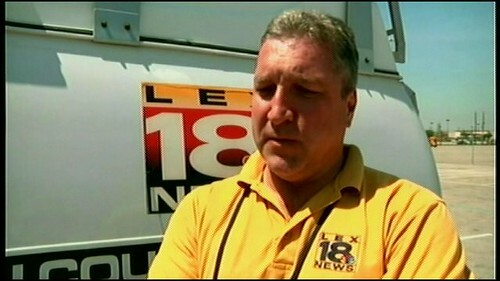 Nor have I swarmed around every type of storm victim, a lesson I learned today when I stumbled upon one Terry Lawrence. But more on him later. First, the news: I don't know if it made the papers up your way, but Mother Nature took an unexpected dump on North Carolina Monday night. I was lucky enough to sleep through much of it, but I arose this morning with the certain knowledge that I'd spend the day paying for that uninterrupted slumber. Was I ever right. It seemed like hours before I hit pay-dirt. In fact, it had only been eighty minutes since I tore out of the door at the TV station, a cameraman on a mission. "Go find Randolph County damage," someone said as I peeled out of the parking lot and onto the interstate. Several miles and a few phone calls later, I was deep into said county and altogether lost. Oh, I knew where I was; I just didn't know where I was going. The overnight storm had raked across the region, leaving isolated pockets of toppled trees among otherwise unscathed neighborhoods. But without solid intel as to where the destruction was, I was forced to drive blind, scouring the passing countryside for any signs of downed branch, tangled power lines or drunken wildebeests. I guess two out of three ain't bad. In a world where television journalists are considered to be lower life forms than lawyers, it's refreshing to see reality trump perception. Case in point: Rob Cook. Wednesday night the WLEX photojournalist was driving his station's satellite truck to Houston for the Final Four. Just outside that city, Cook witnessed a fiery car crash up ahead. A car hit a median; a fire ensued and smoke soon filled the interior. That's when Rob Cook acted on instinct and in doing so, elevated our profession. He approached the burning car, ripped out a window and pulled a woman to safety. Another Good Samaritan managed to free a second passenger. Soon after, flames engulfed the car. Both occupants of the car received minor injuries, but thanks to Cook and others, they lived to tell the story. Heroic? Youbetcha. But of the photogs I know, 3 out of 4 would have attempted the same. That makes us no better than any other wage earners, but it does make us decent human beings with our compassion intact. Sadly, that's a news flash to some. So here's to YOU Rob Cook. We've never met, but I know your type. I work with and compete against them everyday. Speaking of fingers, I'd just wrapped mine around a most righteous hamburger when I got my next assignment of the day: Babysit the plane crash. Okay, that's not a direct quote, but you get the idea. Some eighteen hours earlier, a small plane had crashed into a High Point neighborhood, killing the pilot and a passenger. Tragic, yes and big news to boot. Before neighbors could even grasp what had happened, a squadron of photogs, reporters and even a few management types were assembling on scene. I myself was lucky enough to miss it, as other duties pulled me out of pocket. But a debris field waits for everyone. Which is why, a full day after impact, The Suits dispatched me post-haste. It was not my first plane crash scene and most probably not my last. But unlike other crash locales, this one was occurred in a neighborhood much like my own. Trees clipped in descending order, fuselage wedged in a house, intact engine sitting in the street...let's just say you had to be there. 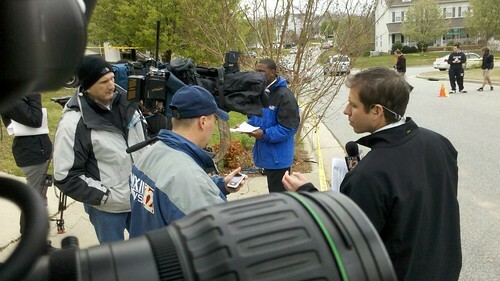 And the media WAS there - print, TV, even a radio reporter or four. By five o clock, we'd gathered in a semi-circle, each crew vying for an unobstructed view of the destruction. Did we stop to gawk at the plane parts, wax emphatically on the frailty of life, vow to never board a stump-jumper again? Not really. We were all on deadline, you see. We were far more concerned with editing, audio and IFB. The fact that the backdrop was a debris field was sad, but not particularly distracting. If that makes me a jackal, well, you know where to send Animal Control. Now, about that irony. Honestly, there is none. Interviewing a pop-star wannabe in the morning and shooting a fatal crash in the afternoon is about as unique as that burger I barely finished. Or maybe I've just become numb to the vagaries of the chase. Do anything for long enough and it becomes the norm - be it looking at life through a tube or feeling compelled to write about it (most) every night.